They divide the nation with their love it or hate it taste. To some, they are the king of meat products and the perfect accompaniment to a pint; for others they're the lowest of the edible low. But pork pies are a British culinary institution and a group of men in Ripponden, near Halifax, has spent more than 25 years giving them the recognition they deserve. 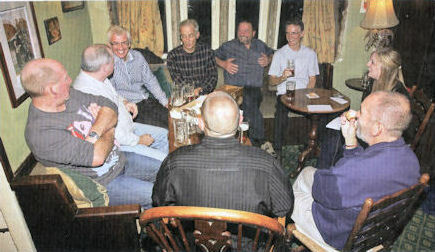 These dedicated connoisseurs are members of the Pork Pie Appreciation Society, which meets every Saturday night in Rippondens Old Bridge Inn. For more than two decades they have stoically pressed on with their self appointed task: to drive up the quality of pork pies, sort the culinary masterpieces from the downright disasters, and have a few pints and a chat along the way. 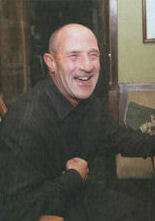 Theres nothing better than a pork pie and a pint, says society president Kevin Booth. Hes not alone in this belief: in fact, his brother and fellow member Stuart even opted to have a three-tier, 50lb pork pie as his wedding cake a few years ago. It caused a bit of a stir, Kevin says. It was cut into portions and served with mushy peas and mint sauce. To the untrained eye, the weekly meeting might just look like ten or so men filling up on pies and pints but the rules of pork pie critique are taken seriously. One of the staple principles is the fetch. Each week one of the members, nominated the previous week, buys the pies from a different, secret location. This week, the fetcher is Mark Travis, who confesses that while he bought 20 pies, only 18 of them have made it to the meeting. we expect the fetcher to give a better mark to his own pies, but he cant abuse his position. Each member is invited to reveal his mark and share his thoughts about the pie, starting with the person to the left of the fetcher. Perhaps a bit ironically, the whole thing began when a new health club opened in 1982. After a Saturday afternoon workout, several of the men used to walk to the nearby pub for a pint One lad used to bring a pork pie that his wife packed for him, and we always watched him eat it enviously; he never shared; Peter says. Eventually, another member of the group offered to bring pies for everyone, and after a few months it was suggested that the responsibility should be shared. Testing the pies isn't all that happens in the meetings the members also discuss the world events of the week, carefully recording the minutes in a book. 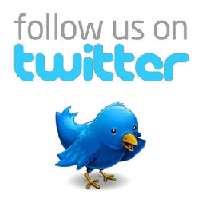 Interspersed with jokes, pint buying and bites of pies, they cover housing prices, the state of the banks and the American economy. 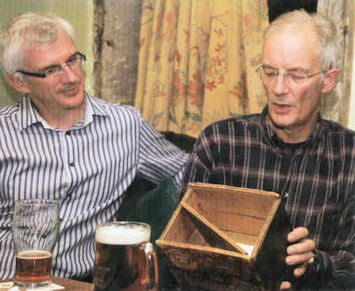 The group is also often joined by Tim Eaton Walker, the landlord at The Old Bridge Inn which is reputedly the oldest hostelry in Yorkshire. 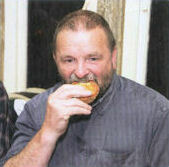 As well as hosting the meetings, the pub is home to the annual pork pie championship held in March, which draws about 60 entrants from all over the country and has had guest judges including celebrity chef Brian Turner. So what makes a good pie? As it turns out, it's more complicated than one might think. In Yorkshire we like the meat to be pinkish, whereas in Leicestershire they like greyer meat, explains Richard Neville. It must be made fresh on the day. It should have short, thin pastry, and preferably no rat runs thats gaps in the meat. No white bits; well filled; nice jelly; no voids; no soggy bottoms; steep sides. It should be tight, crispy and crunchy, with a nice glaze. Phew. According to Kevin: In my opinion, theres no such thing as a bad pork pie; theres only good and great. But the other members are quick to remind him of last weeks meeting, when Kevin was forced to give his own fetch a mark of zero. I couldn't give it a mark, he admits. Even the goose didnt like it. The goose? Yes, theres a goose nearby that gets our leftover pastry. Finally, then, it's time to see how Marks offerings measure up. Overall, it does rather well: Kevin calls it a darn good pie and gives it an 8.5; Phil Batley judges it a good fetch fresh, nice meat, the right size and gives it an eight, and Peter, although he deems it a bit small its a slimmers pie gives it a healthy seven. Richard isn't so sure, though, and gives it a six, saying: it was bland and a bit fatty: Its quite common for the markers to disagree, of course. We can get quite heated about it! says Kevin. It's all friendly banter though. 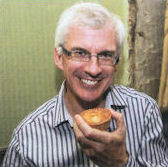 At last the source of the pies is revealed, unusually they are Lancashire pies, from Walmsleys in Ramsbottom. 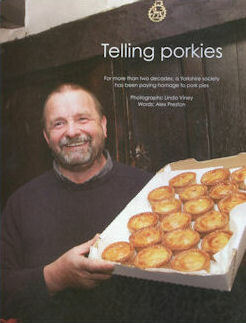 The results are carefully recorded in the book: this is pork pie history in the making. 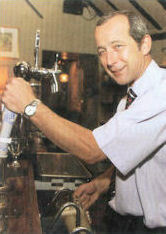 We all like a pie, a pint and a chat, and the order depends on what we feel like, summarises Peter. The pie isnt all it is; it's about the sum of the parts.